"I have reached the conclusion that carpet and fabrics not cleaned and properly maintained have the potential to cause a variety of health problems inside the building environment." Dr. Michael Berry, formerly with USEPA. For almost 60 years, carpets were America’s favorite floor covering. I remember the 1950's, when many homes still had wood floors. "Wall-to-wall" carpet was a status symbol, a sure sign that somebody had finally made the big time. Today nearly everyone can afford carpeting. Wood floors are an upsold option in new homes. Our children learn to crawl, and then walk, on carpeted floors, which seem safer for "rug rats." Our pets play and roll on the rug, seeming to prefer it over hard floors. Carpets are best cleaned with upright vacuums, which cost less, so as carpets popularity rose, uprights became the American vacuuming standard. In Europe and other regions canister vacuums are more popular. But lately carpeting has been leanin' toward the blues. Discoveries of volatile organic chemicals out-gassing began to increase scrutiny of the middle class status symbol's health effects. Many, starting with luxury hotels and upscale residences, began to replace carpets with hard flooring, with often spectacular results. The carpeting industry says its carpets are not really to blame, that it is improper vacuuming, cleaning, and maintenance that makes carpets unhealthy. Carpeting's defenders say carpets act as filters which hold particulate matter better than hard floors. To an extent this is true. Assuming you could get all the dirt stored in an old high-pile carpet into a hard-floored room, it would be obvious everywhere. With that level of filth, which would require many weeks of not vacuuming the hard floor, air quality would indeed suffer, as the carpet industry asserts. We see the carpet-as-filter from another perspective: carpets act as large filters that retain harmful particles and breed tiny organisms. All indoor air quality experts hate carpet, and we frequently recommend its replacement with wood or tile. But these flooring alternatives aren't for everybody and conversion is expensive. So until then, most folks are still going to be vacuuming carpet. This article is about what can live in the jungle below us - an invisible biological ecosystem below our feet. 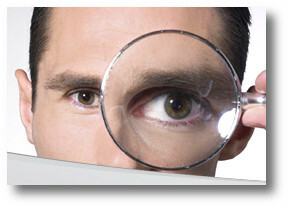 One common perception is that surface dirt represents all the particulate in the carpet. Carpeting, especially styles with tall piles, acts as a sink that collects dirt, which slowly sinks lower into the mat. Particulate infiltration is actually bad for the carpet itself, causing abrasion of carpet fibers, and a less attractive appearance as light reflection patterns are degraded. This deeper dirt, harder for the average vacuum to remove, is the source of one big health issue with carpeting. We use phrases like "man cave" without realizing that a large part of the matter accumulating in our carpets is biological debris. Studies show that house dust is composed of approximately 75% biological particles. Human hair and skin flakes make up a significant portion of common house dust. We shed our skin continuously without noticing. Pet hair and dander are another source of biological debris. Pet allergens, including dander (skin flakes), hair, and dried saliva, accumulate in carpet, especially in the spots where the animal rests. Table droppings and TV snack detritus combine with pet food scatter and litter box tracking to make a continuous flow of nutritious particles filtering down through the canopy, like a rain forest ecosystem. Pollen, small bits of broken leaves, and other organic matter track in, on both human and pet feet. These are unseen on shoes, until the carpet collects them. Small bits of defunct spider-webs rain down from ceilings. Carpet readily absorbs moisture, especially when laid over cement floors. Nutrients and moisture are all that's needed to support biological growth. Now it's dinner time on the lower levels. Many pet owners are dowsing their pet with flea-killer toxins repeatedly, only to have the fleas return. Often this is because they are living in the carpet. 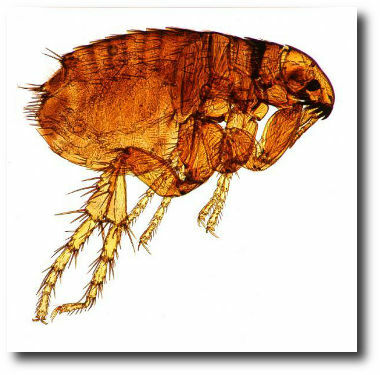 Fleas lay eggs on the pet, but hundreds fall off as the pet romps or rolls across carpet. Only adult fleas need to feed directly on a host's blood. Flea larvae eat dried blood flakes that the female excretes into the environment. Biological debris provides a feeding ground for other insects and microorganisms. Mold is especially fond of clinging to carpet fibers. While mold cannot consume synthetic carpet materials, given a bit of moisture it may grow using cotton or wool carpet fiber as food. Bacteria, viruses, fungi, dust mites, cockroaches, and fleas will also attend the feast. Each organism leaves its own trail of eggs, feces, and body parts. Once this ecosystem reaches a certain level of complexity, it will begin to recycle its own wastes. This transpires mostly invisibly, even while the carpet can look clean. Many readers will have difficulty understanding the microscopic scale of biological contamination. Though technically visible to the naked eye, at maybe 250 to 300 micrometers (one millionth of a meter), thousands of dust mites can still fit on the face of a dime. They can burrow deep into the carpet forest, and their feces are a common allergen. A casual vacuuming will remove maybe 10% of mites. Molds and pollens, measuring two micrometers and up, are the next level down. 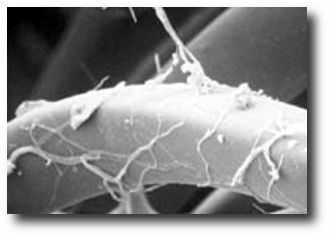 The photograph at the right was made by indoor air expert Jeffery May (www.mayindoorair.com) using a scanning electron microscope (SEM). Magnified 450 times, the electron micrograph shows mold hyphae growing around a carpet fiber. Mr. May suggests that this mold is supported by dust-borne nutrients on the fiber, rather than the carpet material itself. Bacteria come as small as .3 micrometers, the HEPA filter's most penetrating particle size. With approximately 70% of US residential flooring carpeted, we need solutions, other than replacing carpet on a massive scale, right now. The first thing we can do is make sure no moisture is available to nourish the carpet's micro-ecosystem. Modern "tight" housing saves energy, but traps stale air and moisture indoors. It might be as simple as opening a door on a dry day once a week. Maybe running a dehumidifier would help. Or it could involve a complete rework of the home's HVAC system. Extreme cases of water infiltration, for instance where the water table is just below the level of the sump pump, can be impossible to resolve. Once the water is gone, it's time to vacuum. Insecticides will alter the micro-ecosystem's ecology temporarily, but won't stop the flow of nutrients. I think carpeted spaces require extra thorough deep-cleaning as a bio-contaminant preventative measure. This requires strong suction, with repeated vacuuming at an angle to the previous pass. Lots of folks are doing a five minute once-over, when as long as 20 minutes is needed to get the carpet clean. Or using vacuums with inadequate suction and agitation, and thinking how great their carpet looks when only the surface has been vacuumed. Buyers of extremely handy robotic vacuums, which generally do not deep clean, should also use an upright. Many canister vacuums lack powered brushrolls, needed to clean carpets. Setting a correct brush height adjustment is also important. Some inexpensive vacuums with "automatic height adjustment" really just skim along well above the carpet. This may be combined with a soft brush which does not separate carpet piles aggressively. 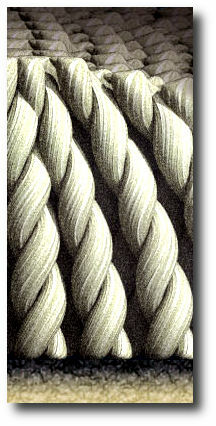 Vacuum against the carpet's nap (grain), repeating six to eight times at different angles. A good vacuum will continue to collect particles from a small patch of dirty carpet for several minutes. Here is another reason we emphasize vacuums with good edge and under furniture cleaning, since carpet beneath furniture and along edges may not get vacuumed thoroughly enough to prevent infestation. Some folks unwisely throw a flea collar inside the vacuum bag to kill any fleas that got vacuumed up. But scientists have demonstrated that vacuuming alone kills fleas, of every developmental stage, with very high percentages of success. Researchers theorized that it's the damaging effects of the brushes, fans and cyclonic air currents in vacuum cleaners that kill fleas. They suggest vacuuming wears away the insect's cuticle, a waxy outer covering, that keeps water in. The bugs then dry up and die of thirst. Regular and very thorough vacuuming controls bio-contaminants in carpets, making them look better and last longer. All unsealed vacuums, whether HEPA filtered or not, will spray this biological debris airborne. Here is one more reason I say "Get, and use, a SEALED HEPA-filtered vacuum with low particulate emissions." Shark Navigator Lift-Away (NV356E) at Amazon.com.